Belize NMS: A moderate and cool northerly airflow will continue to prevail over the area today. 24-hour forecast: Continuing variably cloudy skies with a few showers or periods of rain over the sea this morning, then over southern coastal areas this afternoon and tonight. Other parts of the country can expect light and brief isolated rainfall. general outlook: For Sunday and Sunday night is for a few showers or periods of rain over most of the country, but mostly over central and southern areas during the day and especially over southern and coastal during the night. Today N-NE 10-20 kts Moderate-Rough 5-7 ft A FEW SHOWERS OR PERIODS OF RAIN. Tonight N-NE 10-20 kts Moderate-Rough 4-7 ft A FEW SHOWERS OR PERIODS OF RAIN, ESPECIALLY OVER THE SOUTH. Tomorrow NE 10-20 kts Moderate 4-6 ft A FEW SHOWERS AND PERIODS OF RAIN. Outlook NE 10-20 kts Choppy-Moderate 3-5 ft SUNDAY NIGHT:- A FEW SHOWERS, INCREASING. The tail end of a dissipating stationary front is over the NW Caribbean from central Cuba at 22N77W to 18N84W. A surface trough is also over the Gulf of Honduras from 16N87W to 16N83W. 20 kt N winds are noted W of front. 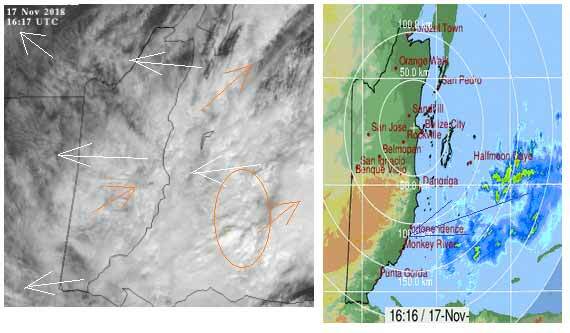 Scattered moderate convection is from 16N-19N between 82W-87W. In the SW Caribbean, scattered showers are noted south of 10N due to the eastern extent of the Eastern Pacific monsoon trough. In the upper levels, an upper level jetstream extends from the Gulf of Honduras to central Cuba, basically over the surface front. Expect the surface front to retreat back while gradually dissipating on Sun. Trade winds will increase across the eastern and central Caribbean today. 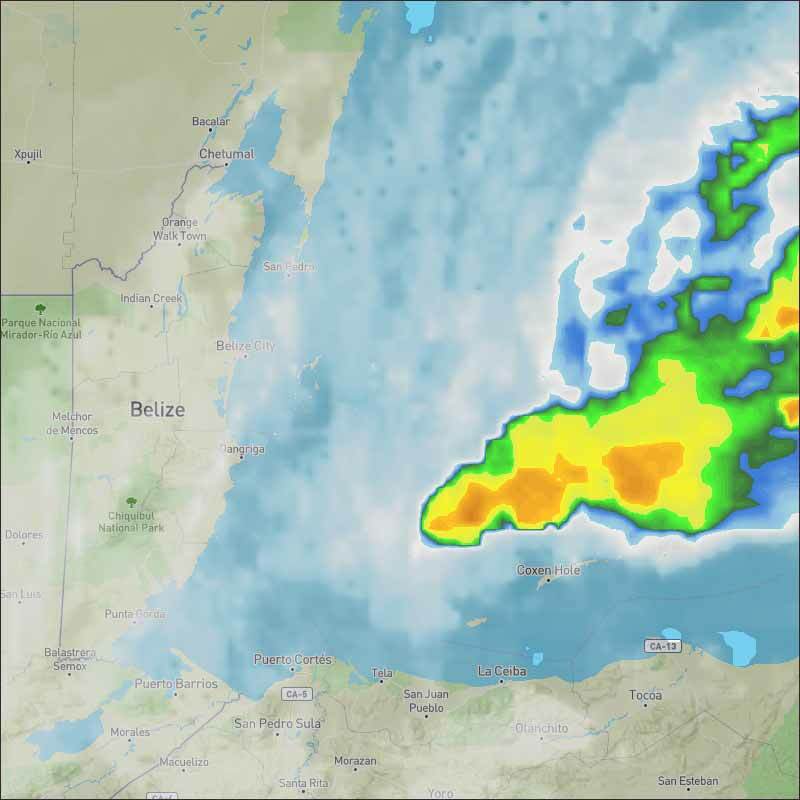 Marine guidance indicates fresh to strong winds and building seas to 10 ft near the coast of Colombia. These marine conditions will persist through Tue morning. The easterly Caribbean winds with a lot of cloud are now pushing back against the cold air, and at the same time, the high level winds from the WSW are crossing over and causing a lot of clashing, presently most is out at sea, but that area of rain has been intensifying and slowly moving closer to land, there are a few small rain showers in land. Looks as if today will be mainly cloudy for most of Belize, a little sun up in the Corozal district, rain, particularly down south is likely to increase and the odd showers in other places this afternoon. 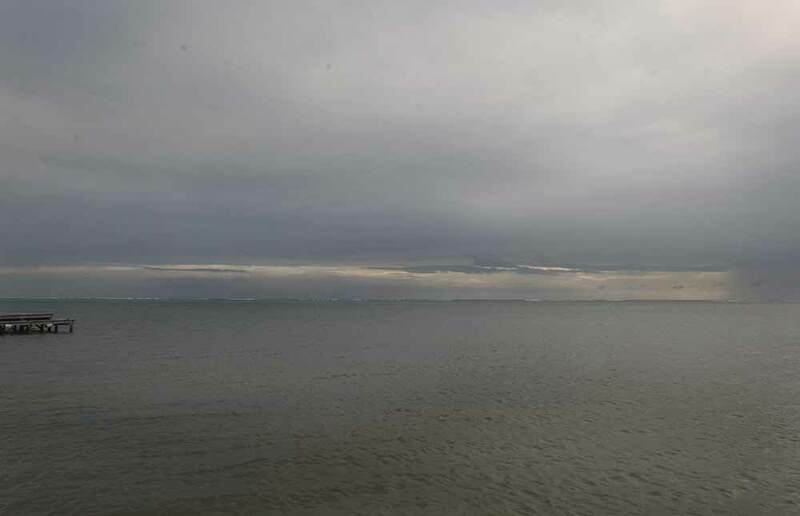 On Ambergris Caye this morning we have a heavy overcast sky and the Northerner is still with us making the sea beyond the barrier reef rough. The expected high temperature for the day is in the low 80's. 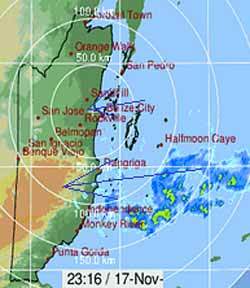 Rain is increasing, as it comes in, mainly south central Belize will be effected, but some in other areas.